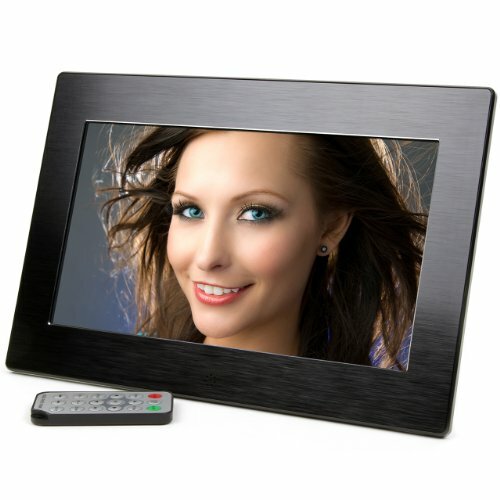 The Micca 10-inch (diagonal) widescreen digital photo frame displays your treasured photos and memories with incredible clarity. With over 3 times the screen detail of standard digital photo frames, your photos are shown with remarkable image quality, in rich and vibrant colors. See the texture on a leaf, individual bricks of a house, or freckles on a face - everything that lets your photo tell the story of a captured moment. Easy to use, with no required setup and no software to install. Just insert a storage device such as a USB flash drive or SD card with photos into the photo frame, turn it on, and the slideshow will automatically start. You can even take a SD card from a camera and play photos from it directly without any additional processing. Sleek, elegant and less than 1" thick with a brushed aluminum, this stunning photo frame delivers a beautifully modern and sophisticated look. It is also very energy efficient, consuming only 7 watts of power in use, or about 1/2 of an energy-saving CFL light bulb. Displaying photos for 10 hours costs less than one cent of electricity. In addition to photos, it also plays background music through built-in stereo speakers or the headphone jack. A compact IR remote is included for convenient access to playback controls. Incredible clarity with over 3 times the screen detail of standard photo frames. Rich and vibrant colors shows your photos with remarkable image quality.